C&E News reporter Carmen Drahl is covering the ACS Conference in Indianapolis in September, and she needs your help. She’s crowd sourcing which events to cover. You can vote on the C&E News Facebook page. Help shape the journalistic coverage of ACSIndy! 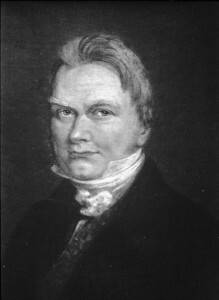 Today, August 20th, marks the birthday of Swedish chemist Jöns Jacob Berzelius (1779–1848). I decided to write this post because, frankly, I knew nothing about Berzelius. He seems to be something of an “unsung hero”, despite his important contributions to science. I thought I’d take the opportunity to collect some key facts about this visionary chemist’s life. The late 18th and early 19th centuries were formative years for modern chemistry. The names of many of the pioneers of that age – such as Lavoisier, Dalton, Avogadro, Volta and Faraday – live on in the minds of scientists to this day (mostly, perhaps, in the form of the units we use). Berzelius lived through much of this revolutionary (in more ways than one) period, and many of his discoveries and innovations have underpinned chemistry for centuries since. Berzelius trained as a medical doctor, and found himself fascinated by the work of Volta and the latter’s invention of voltaic piles. Berzelius incorporated electricity into his medical research, investigating the effect of direct current on unwell patients. It turned out that giving his patients electric shocks did not improve their condition, but this result didn’t abate Berzelius’ scientific curiosity. He was living in the golden (or should that be cupro-zinc?) age of electrochemistry. Berzelius was a systematic experimenter, able to collect and collate vast quantities of data and extract trends and conclusions in his analysis. His examination of the electrochemistry of metal salts led him to his theory of “dualism”. This theory proposed that all atoms bore a charge – positive or negative – and that compounds were formed by the neutralisation of opposite charges. This offered an early analogy to ionic bonding. However, the theory of dualism fell out of favour towards the end of Berzelius’ life, as its inability to accommodate new discoveries, including the developing field of organic chemistry, became clear. It was around the time of Berzelius’ studies on dualism that John Dalton published his New System of Chemical Philosophy (1808), which introduced his development of atomic theory – that elements were made up of indestructible and indivisible atoms, which were identical for a given element. 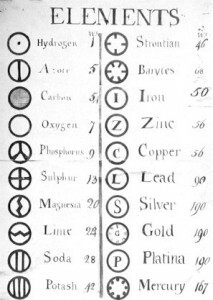 Dalton also published a table of a handful of atomic weights and associated atomic symbols. Unfortunately, Dalton’s determinations were limited in terms of accuracy, and the majority of known elements were omitted. 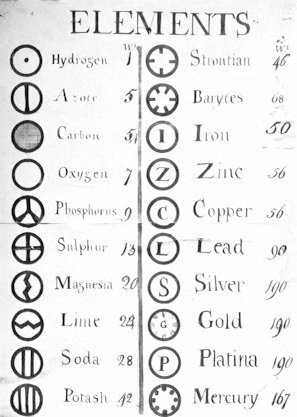 Berzelius systematically examined all of the elements known at the time, and published 43 atomic weights which have proven remarkably accurate (considering the pioneering nature of the work) when compared to modern values. As he used so many elements and compounds, Berzelius began to find the chemical notation of the time to be cumbersome. Chemicals were typically represented by pseudo-alchemical symbols, making the construction and parsing of chemical formulae difficult and error-prone. Berzelius changed all this, and, in a short paper, introduced the basis of the chemical notation we use to this day. He substituted the alchemical symbols for letters: C, Cu, O, etc. The proportion of atoms in a compound was denoted by superscript numbers: CO2. Nowadays, of course, we denote the proportions with subscripts, but in all other respects Berzelius’ notation has stood the test of time remarkably well. Berzelius also discovered four elements: cerium, selenium, silicon and thorium, and in addition introduced several terms to the chemical lexicon – although their meanings have changed since: allotrope, polymer, catalysis and isomer. Berzelius’ systematic identification of the chemistry of minerals, along with his many other discoveries, earned him the Royal Society’s Copley Medal in 1836, jointly with Francis Kiernan. Berzelius’ legacy was doubtless cemented by his publication of numerous widely-translated textbooks. It is interesting to consider that these textbooks may have educated some of the big names of the next generation: Mendeleev, Clausius, Helmholtz, Joule, Bunsen, perhaps even Darwin. Whether or not they did, it is doubtless that they, in common with generations of chemists since, owe much to the discoveries of Berzelius and his contemporaries. So, today let’s remember Berzelius, one of the “Fathers of Modern Chemistry”. Berzelius is the academic great-great-great-great-great-great-grandfather of Prof Martyn Poliakoff, of University of Nottingham and Periodic Table of Videos. Small world? Like many chemists, Berzelius has a piece of glassware bearing his name. A tall and thin glass beaker is otherwise known as a Berzelius beaker. All images are public domain. As the 25th leap second approaches (If you haven’t heard the news), there’s been a myriad of tweets and Facebook statuses joking about how to spend that extra moment when the clocks hit 11:59:60 UT. What many people don’t realize though is that a lot can happen in a second. Let’s start with the basics. The SI definition of a second is 9,192,631,770 periods of the radiation produced by a particular transition in a cesium-133 atom. In the same second, this radiation (or any other form of light in a vacuum) would travel 299,792,458 meters, or approximately 7 times around the earth. Speaking of light, our sun consumes around 500 billion kilograms of hydrogen every second to produce around 10^27 joules of energy. Although we receive only about a billionth of the total energy (10^18 joules), it’s still enough energy to power all of humanity for a year. The amazing rate of natural events isn’t only in outer space. The earth experiences over 100 lightning strikes every second, amounting to more than 8.5 million strikes every day. The Amazon river discharges 175,000 cubic meters of water per second into the Atlantic, enough to fill seventy 10-lane Olympic swimming pools. Finally, let’s not forget human accomplishments. I could not have written this post without help from Google, which is performing over 30000 searches every second. Sequoia, the IBM BlueGene supercomputer at Lawrence Livemore National Lab, can perform over 16 quadrillion operations (that’s 1.6 * 10^15!). However, even with these super computers, we can only simulate simple biological systems (ie: basic protein folding) for a few microseconds, much smaller than the actual time scale of cellular events. Each of the tens of trillions of cells in our body, for example, have proteins capable of replicating 50 nucleotides of DNA every second. The things cited here barely scratch the surface of all the events happening every second of every day. It’s truly wonderful to appreciate everything that is going on around us without our knowing. I hope you enjoy the extra second and have a little new perspective whenever someone says “Seize the moment”. ****A word of caution to readers: Most of the values in this article, other than the exact definitions like the second or the speed of light, are meant to be order of magnitude approximations. You are likely to find different values if you use different sources.